Expert in planning applications, Planeum has developed a Labor Costs Planning starter pack, build on SAP BPC, these application blocks will allow you to speed up the implementation of your project. Evaluate the impact of compensation changes, entries and leavings, promotions or employer´s contributions on the total Labor Costs. 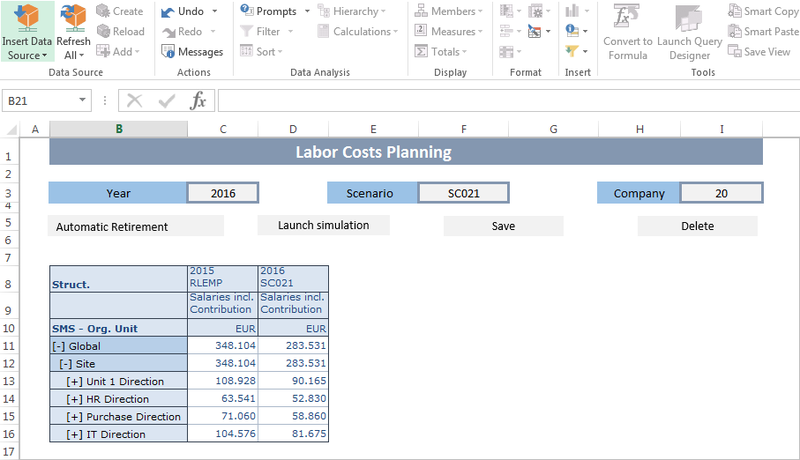 Spend more time on budgeting, forecasting and analysis and less on tedious excel worksheets consolidation work. Initialize the planning process with a single and shared version of actual data and build your workforce, compensation, bonuses and employer’s contribution hypotheses in a secured environment. Plan your workforce changes at aggregated level or per employee and benefit from SAP BPC Embedded on Hana powerful engine to evaluate the impact of your various hypotheses on the labor costs. Example of aggregated planning per FTE. Assign tasks to each performer, inform them via automatic email notification and monitor the progress of the process in the Process Monitor Cockpit. Build and run easily various scenarios. Use the web based Planeum’s Accelerators to maintain master data and enter your hypotheses. Launch the simulation and check directly the impact. Hypotheses management and simulation calculation. Copy existing scenarios to initialize new simulation scenarios. Assess the impact of each hypothesis made and analyze them in detail. As the simulation results are calculated per month, you also have access to a budget base defined at a month level allowing you to follow up the execution and analyze the differences.